Terrore Nello Spazio, or Terror in Space (AKA Planet of the Vampires) is a 1965 sci-fi/horror movie directed by Italian master of supense and atmosphere Mario Bava. It is about some space explorers who answer a distress call and land on a planet only to find out that they were lured into a trap by evil incorporeal entities who want to steal and take over the explorers' bodies. This was a very low budget production that really does play like a comic strip come to life. The financial limits, of course, brought out the creativity from Bava and his crew, with inventive visual effects to attempt to obscure how cheap the sets are. The film is highly campy, but at the time of its release was considered quite gory and violent. Bava worked with so little on so many films, but always managed to entertain. While I can't call it a good film, I have to admit I enjoyed it for its building tension and dread throughout, its visual style, and its superbly sinister musical score by Gino Marinuzzi Jr. The sound quality is surprisingly good, and fans of early electronic and early sci-fi/horror should appreciate this excellent release. Gino Marinuzzi Jr. is a major musical figure twice over, in movies as well as in composition and education, and he comes by that presence as his birthright. His father, Gino Marinuzzi (1882-1945), was a major Palermo-born conductor and composer, known around the world from the dawn of the 20th century, closely associated with the music of Verdi, Puccini, Wagner, Donizetti, Bellini, and Richard Strauss. Gino Marinuzzi Jr. was born in New York in 1920, a period in which his father held posts in the United States, and graduated from the Milan Conservatory in 1942. He was closely associated with Teatro dell'Opera de Camera in Rome, and made his conducting debut with the opera's ballet company in 1947. Marinuzzi subsequently turned to composition, including writing music for movies and radio. He entered the Italian film industry in 1950 with All for Love, and over the ensuing decade wrote the scores to such diverse productions as Jean Renoir's The Golden Coach (1952) and Vittorio Cottafavi's Hercules and the Captive Women (1961). Marinuzzi also taught composition from the early '50s onward (among his most notable students is pianist Vittorio Bresciani) and later became fascinated with electronic music. In 1956, in collaboration with Federico Savina, Marinuzzi co-founded the Accademia Filarmonica Romana. His later achievements include the creation of the Fonosynth 2 elettronico, an instrument on which electronic music can be composed. Marinuzzi's film assignments in the 1960s varied between reasonably traditional subjects, such as I Castrati (1964), Terrore Nello Spazio (aka Planet of the Vampires, 1965, directed by Mario Bava and utilizing Marinuzzi's electronic composing skills), and the offbeat espionage thriller Matchless (1967). He left the film industry for nearly 20 years after that to concentrate on teaching and serious composition, returning in 1984 to write the score for the television series La Piovra (aka The Octopus). 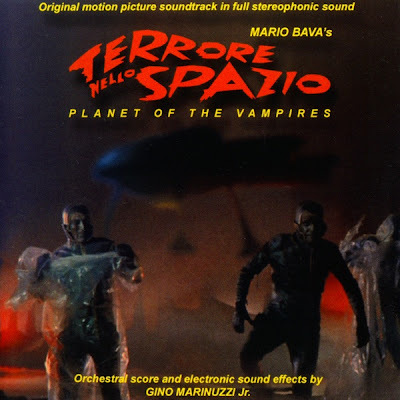 His score for Planet of the Vampires, perhaps his most critically acclaimed film work, was lost from home-video versions of the movie from the early '80s until the start of the 21st century, thanks to a decision by its one-time distributor, Thorn-EMI, to replace Marinuzzi's score with one that they owned outright and on which no royalties would be due. The 2001 reissue of the movie on DVD, by way of MGM/UA, restored Marinuzzi's music, which was also released on a soundtrack CD for the first time in early 2004.
did you hide the link someplace? really love the thing, good work. the soundtrack stuff is key. thanks again! I'm not sure what happened. Strange Ranger must have deleted his original post. I left a comment on it, which doesn't appear here. The download link was present in that post also, because I downloaded the album. If Strange Ranger doesn't notice the comments by tomorrow morning, I'll send him an e-mail to inform him of the problem. Sorry, folks. I have no idea what happened. Maybe because I rushed my post yesterday, I forgot the link. Should work now, enjoy! No worries. Thanks for the timely fix and the great share.